I've just found my n+1. Where can I get a Recumbent conversion for my Brompton? It looks like a Juliane Neuß conversion, but I don't know where you can get one. The last time I looked, I couldn't find an English language page which looked like you could order one through (or which gave suitable contact details). There are a number of sites which may be more helpful, but speaking German would probably be useful! There ware a limited number which were home produced, and this was stopped. The only chance is an ebay or similar find. I've seen that one, was it the wife riding or the husband? The wife is American and very chatty. The husband English and not even remotely polite. The child is an obnoxious brat. Double bouncy, schmidt and rohloff. Someone spent some dosh. 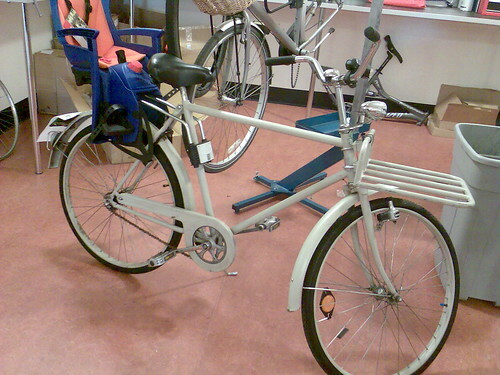 That's an old Velo solex. The same two marketwizard's have now jumped on the singlespeed bike hype, go figure! I think it was husband and wife, it was either 2006 or 2007 summer, I can't remember. 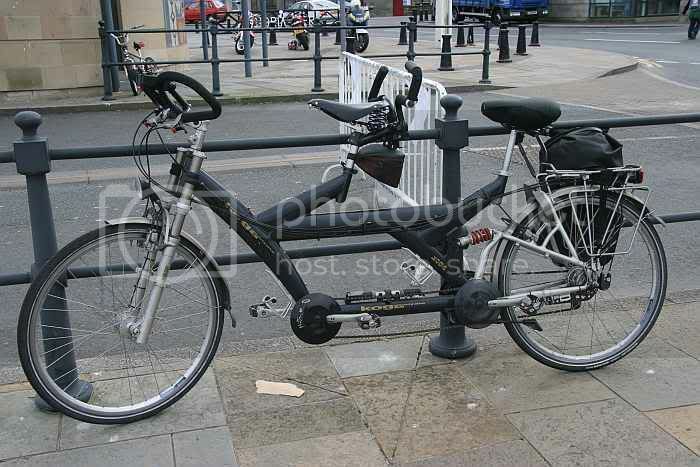 We used to have one, I hated being taken places on the back of it. I do remember the days of ethanol petrol mix, and my Dad having to use water to separate the ethanol from the petrol, else it'd dissolve the plastic tank of the solex. As it's a CYCLING forum, I thought it would be a good idea to have a thread to compliment the one in vroom. Being riden, it didn't look as good as the brompton. He was shifting though. 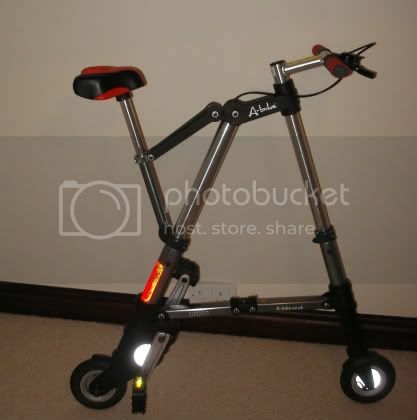 I've seen one of those in Braintree, a couple of times - the same guy, from a distance and in the dark (waiting at bus stop with my Brompton folded up), but you could tell it was decent quality - I reckon me and him must be the only people to ride round Braintree on folders! Seen a few times in Sale on our commute: A white dahon folder emblazoned with the word Google in big letters. 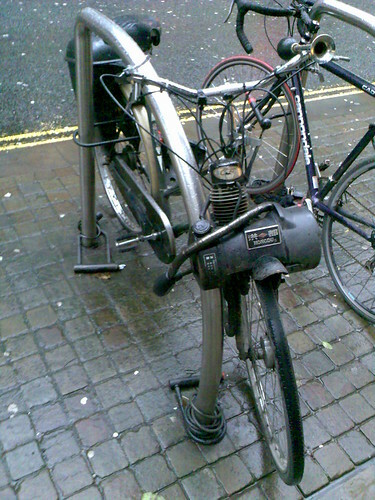 My son says that he saw a bike fitted with a steering wheel in the city centre recently. Continuing the folders theme, I had to move this in the cloakroom this morning so I could have a pee. I think we need to introduce an 'own bikes don't count' rule here. I did wonder. But then thought I remembered that somebody had commented on an own car on the other thread. I won't mention a bike again. Tandem Child back trailer, seen this morning in Earley, Reading. As per a standard child back trailer but had two ~5 year olds on the school run behind mum on a MTB. Added respect for mum there was a third child (18 months) on a seat on the top tube. A Hooger Booger Grinder mountain bike - the only other bike in the rack at work. Green main frame with purple forks and rear triangle. Exage kit with STi shifters. Commuting tires and a rack. Most the hits on Google seem to be for surf board with the same name. Looks like a gnarly retro rig to me. The LBS (Fred Williams, Wolverhampton) have built a curious thing that has some kind of funny clutch hub and a really long chain that runs under the BB (hard to explain...) that allows you to pedal forwards and freewheel as usual, but if you pedal backwards, will also propel you forwards. No real use, but interesting. Doesn't like hot linking. Copy and paste jpg URL. Drew Buck's mount for PDP '07. Yep, was kinda like that I think. I seem to recall that the 'other' chain guide thing was more towards the bottom bracket though.